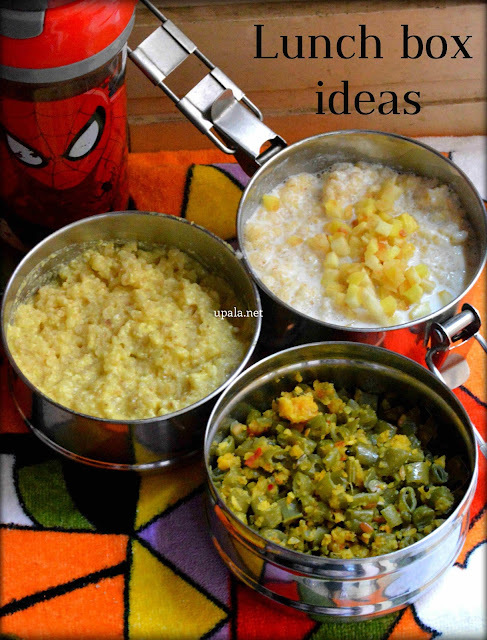 Lunch box ideas Morkuzhambu Rice, Curd Rice and Beans paruppu usili- this Lunch box idea is apt for elderly kids who go to higher standards, College goers and Office goers. The menu is a fantastic combo of all nutrients and so makes it a healthy one. Also the No Oil Mango ginger pickle is a highlight. For more Lunch box ideas, click here. 1) If you don't want curd rice, you can substitute it with Rasam rice. and mix with Morkuzhambu and Curd.